Find the product and check the price here! Draw Length: 12” to 30’’. Draw Weight: 5 to 70lbs. IBO Speed: 315 Feet Per Second. The name of the product Bear Archery Cruzer G2 Adult Compound Bow is only half the story. It can be your best partner if you like hunting. It’s supremely good performance with maximum versatility makes it better than any other. The G2 Adult Compound Bow is suitable for people of all ages. No matter if you are a beginner or an experienced archer, you will find Cruzer G2 helpful for you. Not only this, the affordable price of the product is not something that comes so often. The advanced grip design of Cruzer G2 makes it is easy to handle even when you are a beginner in archery. Moreover, It weighs only 3lbs. The Cruzer G2 Adult Bow can shoot accurately up to a distance of 315 feet per second unlike any other. It comes with an adjustable draw length of 12’’ to 30’’. The Bear Archery Cruzer G2 Adult Compound Bow is designed and engineered in a perfect way to make you enjoy the best hunting and target archery experience. It is made up of high-quality materials to make it durable and last for ages. Despite being durable, the Cruzer G2 Adult Bow is made by using lightweight material and it weighs only 3 lbs. 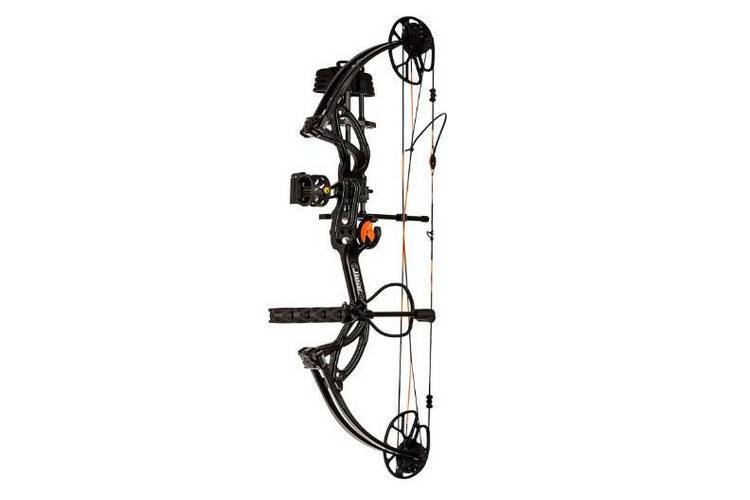 The Cruzer G2 Adult Bow comes with a dual cam structure making the limbs stronger and stiffer. It possesses a stabilizer and a sling making it the perfectionist for target archery. The whisker biscuit of Cruzer G2 Adult holds the arrow for a better aiming experience. The product is set up using an Allen wrench, thus eliminating the need of bow press. The Cruzer G2 Adult Bow comes with a dual cam system. The cams make it easy for the archer to draw the arrow, thus making the archery release smoother. Movements of the cams play a major role in getting a straight shot. The draw length can easily be adjusted with the help of a dual cam system. The cams make the limbs stronger and increase the velocity of the shot amazingly as 315 feet per second. Yes, you guessed it right. The Cruzer G2 Compound Bow is perfectly suitable for hunting. The dual cam system of this product releases the arrow at a velocity of 315 feet per second, while the stabilizer lessens the shock and makes the archery release quiet. The Cruzer G2 Compound Bow is the perfect match if you want to go spot and stalk it is portable with a receptacle that can contain 5 arrows. The arrows that come with the Bear Archery Cruzer G2 Adult Compound Bow are designed in the perfect way. But even if you want to replace your arrows with some other arrows of your own will, it is not a problem. You have to buy arrows of length 0.5’’ or 1’ more as of the draw length of your bow. You can buy arrows of length 30.5’’ or 31’’ for a bow with a draw length of 30’’. It’s a great bow and here are some of the reasons you might want to prefer it over others. The Bear Archery Cruzer G2 Adult Bow comes with six Trophy Ridge Accessories. The product comes with peep sight enabled, all you have to do is to aim through the peep sight to hit your target perfectly. The Cruzer G2 has a whisker biscuit made up of artificial bristles which hold the arrow before archery release. It makes the aim perfect while the arrow-vanes can easily pass through the bristles. The product is ready to go hunting with a 5-arrow quiver. The Cruzer G2 Bow comes with a Stabilizer and a sling. The Stabilizer lessens the shock while shooting and the Sling helps you to hold the bow easily. The product comes with a nock loop making it easier to hold the arrow while aiming at your target. The Bear Archery Cruzer G2 Adult Compound Bow is suitable for people of every age. It values your money as it comes for less price and with more features. The dual cam system makes the archery release smoother. It’s wide draw range with a peep sight enabled makes it easier to aim anywhere. The Cruzer G2 Adult bow is all you need if you want to go hunting, or you are a fan of target archery. The Bear Archery Cruzer G2 Adult Bow comes in a variety of colors. You can choose yours. Bear Archery Cruzer G2 Adult Compound Bow is a great compound bow whether you want to go hunting or your passion lies in target archery. It’s extremely lightweight and doesn’t need bow press. It’s great value for money although you may have to take it to a pro shop before the first use if you’re a beginner. Overall, it’s among the very best lightweight compound bows out there.